Ancient history will be coming to life in the Staffordshire market town of Tamworth after a figure from medieval England was chosen as the subject of a new public sculpture. The town fathers carried out a public consultation exercise to determine what artwork was to be placed on a major traffic island outside Tamworth Railway Station. The overwhelming response was for a sculpture based on the town's rich Anglo Saxon history. And, as the piece of artwork takes shape, it is apparent that the subject of the sculpture is the iconic Lady Aethelflaed, daughter of King Alfred the Great. 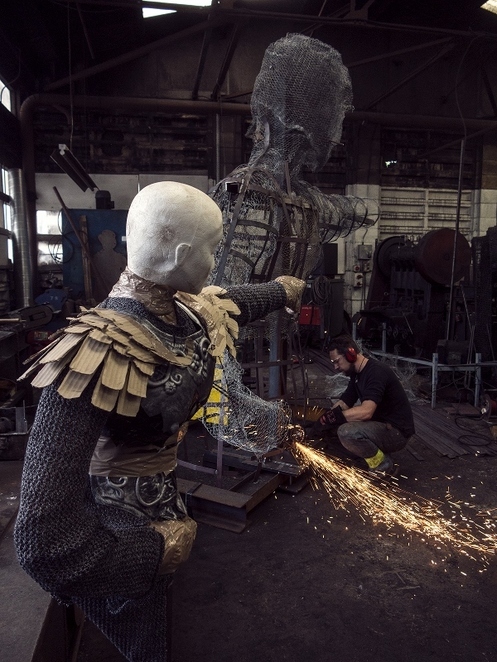 After several weeks of back-breaking labour by artist and sculptor Luke Perry, images of the steel statue of the ancient Saxon warrior queen have now been revealed. 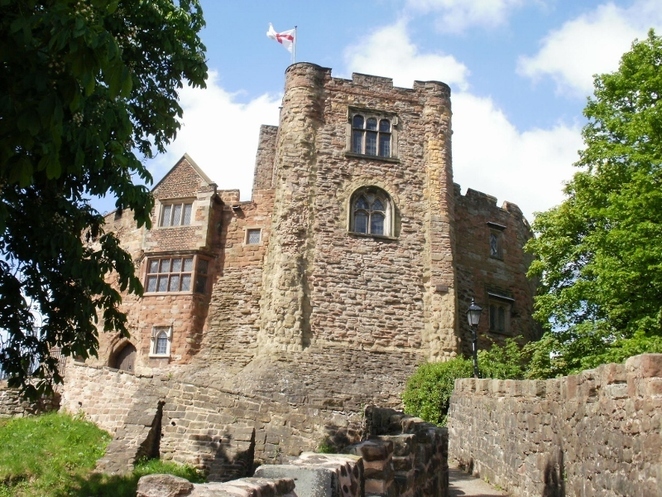 Lady Aethelflaed was credited with helping the Mercians drive the Vikings out of the area in the early part of the 10th century, and establishing a fortification on the site of what is now the Norman grade 1 listed Tamworth Castle. 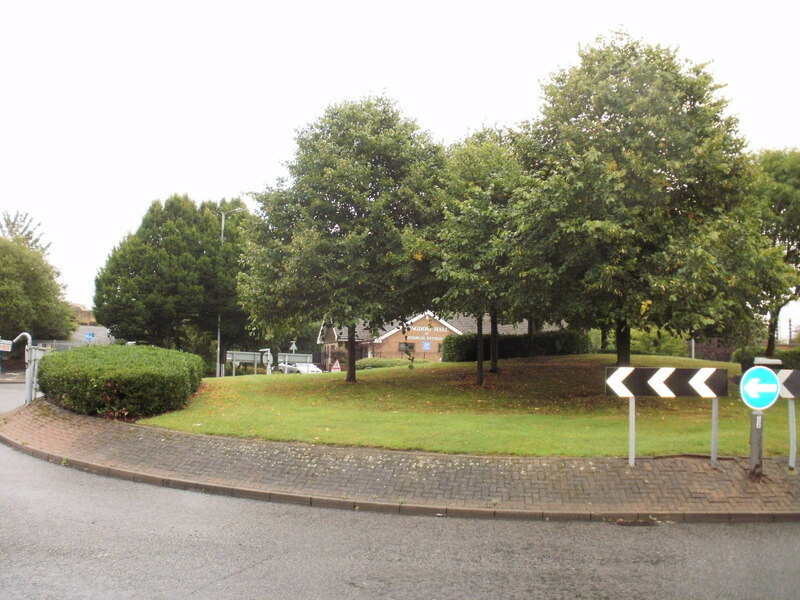 Once complete, the sculpture of Lady Aethelflaed will rise six metres, or nearly 20 feet, above the ground on the roundabout which sits at the junction of Offa Drive and Saxon Drive, where she will greet visitors as they step off trains at the railway station and point them towards the town centre. The 'Roundabout Art' project is one element of the Arts in Unusual Spaces initiative, funded by Arts Council England, which will see art in all its forms popping up in a variety of locations across the borough. 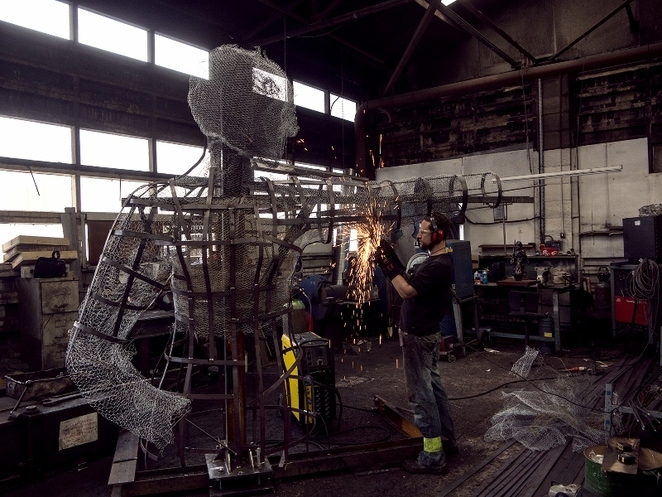 The sculpture is being funded jointly by Tamworth Borough Council, Arts Council England and Tamworth Gateways Project – a partnership between Staffordshire County Council and Tamworth Borough Council. For the past few months, Luke has been hidden away in a workshop outside Birmingham, welding, hammering and hand-sculpting the magnificent 'iron maiden' as he has affectionately named her. The internal structure, or 'skeleton', is now complete, as is the breast plate, back plate and shield – which itself stands taller than Luke. The chainmail is nearing completion and her sword, which is a work of art in itself, is also around 50 per cent of the way there. Luke said: "I don't do anything with machines because I don't like the aesthetic that produces. It's all hand-sculpted, which means I'm a bit broken as it's physically quite abusing. It's great to see her starting to take shape though. The internal shell was key to the build. We are working from a life-sized model and everything has to be scaled up 3.5 times. 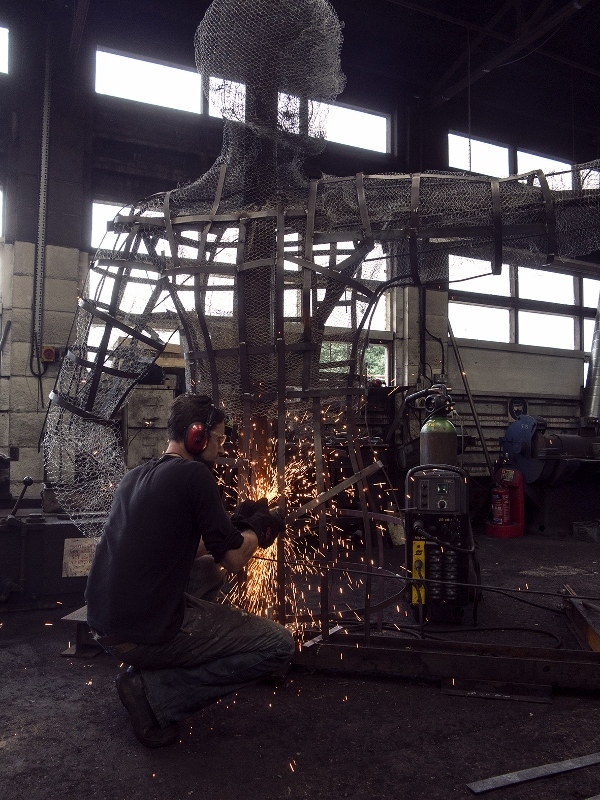 Once we had the shell this was covered in chicken wire so the form could be easily manipulated – getting the form right has been the hardest part so far. Once all the angles and dimensions are right, you wrap it all in steel banding and take all the chicken wire out." As well as making sure everything was in proportion, Luke also had to ensure that everything was correct for the period. For this, Luke called in the services of a fellow artist and 9th-century historian, who travelled from Berlin to assist on the project. "We're making sure all the details are authentic," added Luke. "It's not exactly how Aethelflaed would have looked as women of the time would usually be almost completely covered in fabric, but the interpretation is more in keeping with the Romantic, symbolic representation of women depicted back then." Members of the community were involved in the design of the sculpture during consultations, workshops and live clay modelling sessions. The final model was the result of consultations with more than 100 people who spoke to Luke about what they are most proud of about Tamworth. The sculpture was designed to reflect the town's Saxon history, but with an 'alternative, modern twist' that places it firmly in the 21st century. Also known as Tamworth's 'Lady of the Mercians', Queen Aethelflaed played a pivotal role in English history by building a chain of fortifications against Viking invaders throughout the Kingdom of Mercia. Despite being the daughter of Alfred the Great, her accession as a female ruler has been described as one of the most unique events in early medieval history. Councillor Joy Goodall, Tamworth Borough Council's Cabinet member for Environment & Culture, said: "These images provide a sneak peek at Lady Aethelflaed and give a real feel for how large and impressive the finished article is going to be. This is an exciting project celebrating an important element of the town's history, which will hopefully serve as a lasting legacy for years to come, as well as encouraging more visitors to the area."